1. Consistently correct – if you repeat the exact same movement multiple times you will get the exact same result, and the result accurately represents the true movement. 2. Inconsistently correct – if you repeat the exact same movement multiple times you will get different results (hopefully only slightly different, but sometimes wildly different), but averaging them will give you a result that will accurately represent the movement. 3. Consistently incorrect – if you repeat the exact same movement multiple times you will get the exact same result, but the result does not accurate represent the true movement. 4. Inconsistently incorrect - if you repeat the exact same movement multiple times you will get different results, and the result does not accurate represent the true movement. As you can see from this table, when you put 100N on the force plate the voltage is equal to 1V. When you put 200N on the force plate the voltage is now equal to 2V, 300N = 3V etc. This force plate would be extremely easy to calibrate, because the relationship between voltage and force is linear (i.e. if you increase force by 100N the voltage changes by 1V). Consequently, if you had access to the raw voltage data you would simply multiply it by 100 to get your force value. For example, if the raw Voltage was 1.5V you’d be quite confident that the force is 150N. Therefore you multiply the voltage value by 99.206, and then add 1.9841 to the value to obtain your force result. To assess the consistency of the calibration you could check a few different voltage values with these three calibration equations. For example, if you were to obtain a reading of 3V and convert this to force using these equations your result would be 300.0N, 300.4N, and 299.6N. This is a great finding, with an extremely small amount of error. However, if you obtained a voltage of 10V your result would be 1000N, 1006.1N and 994.0N. As a percentage this is a lot more error than at 3V, with the difference between using the Test 2 and 3 calibration 1%. This is still a quite small error in the grand scheme of things, so you would be reasonably confident using these equations to obtain force values from this force plate. If you were particularly interested in the accuracy of your data, you would perform another few of these tests to make sure there wasn’t a trend or drift occurring (eg. as you perform more tests the voltage numbers get consistently higher for the same load), then average the numbers for each trial for each load and create an average calibration equation. This should get you quite accurate results when you calibrate your sensor. 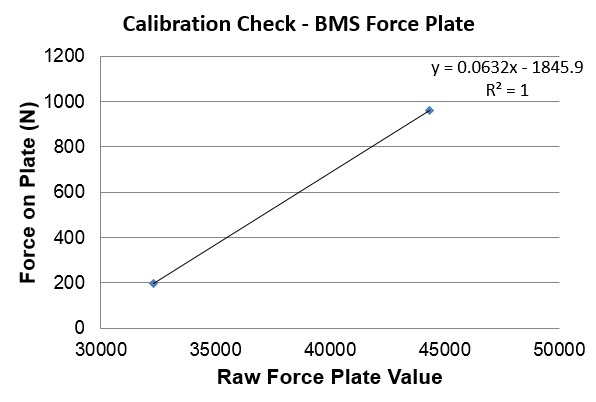 As you can see in the force plate video, for this software all you need to do is put two different known loads on the force platform, and a calibration equation is created based on the raw data that the force platform records. Typically you want to use more than two loads to reduce any chance of error, but this is an easy example. The known force (in kg) for the first load was 20, and for the second load was 97.8. What the force plate reported for these two loads was 32,289.69 for the first load and 44,357.74 for the second load. This results in a “Calibration Factor” of 0.0632 – but how did they get this? 1. Convert the mass placed on the force plate from kilograms into Newtons, because that’s what force is reported in. This is as simple as multiplying the mass by gravity, which is approximately 9.81m/s. The two forces used in this calibration are now 196.2 and 959.4 Newtons. The purpose of this equation is quite simple – to get the real force value you simply multiply the raw force plate value by the scale and then subtract the offset. For example, if we multiply the raw force plate value recorded for the second load (44357.8) by this scale (0.0632) we get the value 2803.4. If we then subtract the offset from this value we get 957.5. This is the real force in Newtons, which if we divide by 9.81 to report in kilograms would give us 97.6kg. This is the same mass as the second load placed on the force plate (out by a couple of hundred grams due to rounding off errors) – and therefore you can see just how the calibration was performed. You can apply this method to any data you collect to either calibrate it or check that it is giving you the correct values.